1. A Travel Document/passport valid for a minimum period of 6 (six) months from the end of the proposed journey. 2. Assurance of your re-entry into your country of residence or origin. 3. Return Air Ticket and onward facilities (including visa) to your next destination. 4. Sufficient funds for your stay in Indonesia. 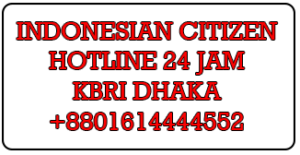 For your information, the Indonesian Immigration Authorities reserve the right to refuse entry into Indonesia. Bring all necessary supporting documents (Sponsor Letter/Hotel Confirmation, Visa Receipt and Covering Letter) with you when you go to Indonesia as Immigration Officers at the airport might ask for those documents on your arrival. 12. Proof of the Clearance letter from Indonesian Immigration (Limited Stay). 4. Reference/recommendation letter from Airlines Offices (package tour arrangement). • Application must be submitted at least 2 (two) weeks prior to the date of departure. • No additional / extra fees. 1. Is it difficult to obtain visa entering Indonesia? 2. How long will it take to obtain visa after submitting visa application? The visa official will check and approve your application. For the approved application, Visa officer will contact you and inform when you can collect the visa. 3. Some applications may need to get immigration approval from Indonesia immigration authority. Normally, you may get the approval within three weeks. After we receive the approval, Visa officer will contact you and inform when you can collect the visa. 4. I have submitted visa application for more than three weeks, but I have not obtained the approval. Why? 2. The immigration authority is unable to contact your counterpart because the contact number or person can not be reached. 3. the Immigration authority is denied your visa application. 5. Why my application is rejected by the Embassy? 6. Can I submit visa form and required documents by email or fax? No You can not. You must submit the visa form and required documents completely and directly to the visa counter.